Verisign patents aspects of its TLD creation and management system. 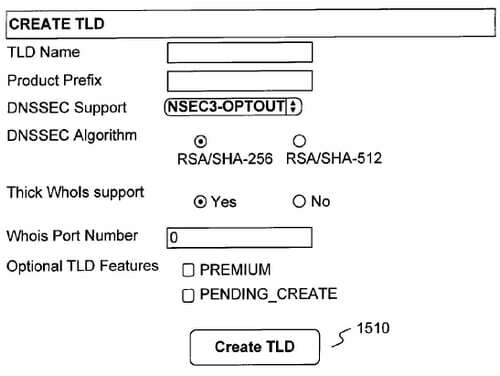 A diagram from Verisign’s patent for TLD management. When companies started applying for new top level domain names, most of them reached out to existing registry services providers to handle the backend management of those domains. Companies like CentralNic, Neustar and Verisign (NASDAQ: VRSN) were eager to sign contracts with registries. Managing lots of new top level domain names added to the complexity of existing systems, though. Registries built new management platforms or restructured their existing ones to accommodate the variety or rules these new TLDs came with..
Verisign, the .com registry, just got a patent (pdf) for certain aspects of its TLD management system. Systems and methods for creating a new domain, such as a top-level domain or a second-level domain, make use of a Domain Manager that enables a user to enter data that is necessary or optional to implement the creation of a new domain. Systems such as, for example, a Registry and one or more Registrars, may use the data defined by the Domain Manager to create a new domain. Getting the patent has been a long road. It began with 30 claims back in 2011. CIRA, the .ca domain name registry, has a pending patent for aspects of its TLD management system.